Before I start waxing poetic about Amazing Spider-Man #4, I thought it was necessary for me to mention that Marvel’s Original Sin miniseries has actually been a pretty enjoyable read, filled with some worthwhile twists and action. It’s considerably better than last year’s Age of Ultron and Infinity events, and in some ways, might be the company’s best mega-crossover since Civil War … pending on the resolution, of course. However, while the actual Original Sin series has been pretty great, over the past month or so there’s also been a number of clunky tie-in issues in certain ongoing series that feel like editorially-mandated afterthoughts. Of course, that’s just the nature of the beast when it comes to the comic book industry these days, but I still feel entitled to complain when I’m enjoying the latest arc in James Robinson’s Fantastic Four and the entire momentum of the storyline seemingly grinds to a halt because it’s Original Sin month across Marvel. 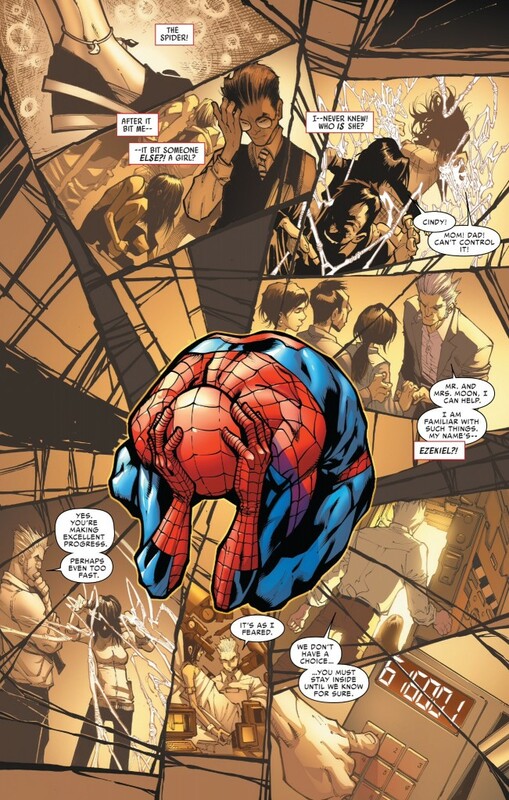 Fortunately, Dan Slott had some foresight to plan ahead with ASM by teasing Spider-Man’s “big sin” in the opening issue of the relaunched series. As a result, ASM #4’s official introduction of the infamous “second spider-bite victim,” Cindy, aka “Silk,” is not as awkward or momentum-killing as some of the other Original Sin tie-ins I’ve read. That’s not to say ASM #4’s narrative structure is devoid of issues. Slott works in some obligatory mentions of the Parker Industries/Electro/Black Cat threads he’s been crafting since ASM returned in April, but they all take a backseat to the Spider-Man/Cindy story, which in turn is planting a heckuva lot of seeds for the Fall’s “Spider-Verse” event. As a result, I’m probably more primed to learn more about Silk and Spider-Verse than I am in seeing the Electro/Black Cat threads come to fruition. I discussed some of my biggest issues with Slott’s characterization of Black Cat in my ASM #3 write-up and even in the brief glimpse we got of her in this most recent issue, my opinion hasn’t changed. As for Electro, I was intrigued in some of what Slott was doing with the character, but I probably would have cared a lot more if he wasn’t inserted into this opening arc in large part because he was the featured movie of the terribly reviewed/poor performing The Amazing Spider-Man 2 film. But back to Silk and Spider-Man. Putting aside the fact that the mere existence of Cindy means one of the greatest origin stories of all time in Amazing Fantasy #15 has just been retconned, I think the character has a lot of potential and on first blush, I welcome her into the Spider-Man universe. I’ve heard the term “Mary Sue” – an overly idealized, fan fiction-ish character – thrown around by some people in regards to how they described Slott’s depiction of Cindy. But since most of the people saying that are people I regularly disagree with about all things Spider-Man, you probably can guess what I think of THAT opinion. From my vantage point, Silk is, for obvious reasons, very similar to Spider-Man in terms of powers and abilities, while being different enough (organic webbing, more speed, less strength) to not feel like a clone or a copy cat. Plus, when it comes to creating characters to play off of Spider-Man, I always welcome folks who have power, but no responsibilities. You put a character like that alongside Spider-Man, work in an intense situation involving a villain (say, Morlun) and the drama writes itself. Additionally – and at the risk of introducing a political debate on the blog – it’s refreshing that this new character happens to be a powerful woman. The fact that it’s a still big deal whenever a new female superhero is introduced (see last week’s female Thor hysteria) or an established heroine finally gets her own book after being designated a supporting cast member or teammate for years (Storm, Captain Marvel, Black Widow, etc. ), just further emphasizes that the industry has a ways to go when it comes to gender issues. And people out there who are complaining that it’s just quota filling when it comes to female or minority-race comic book characters, are missing an even bigger issue in that the dynamics of the industry are changing and it’s not just white, male teenagers who are reading funny books anymore. Comic book publishers need to adapt or die with these demographics, and as long as these female and minority characters (please note that twice in a row I intentionally designated women as being a separate grouping from “minorities”) are written well, then who I am to complain about it? I think what intrigues me most about Silk is the “woman out of time” motif that Slott establishes. To watch a young woman cope with the fact that she was essentially siphoned out of civilization 10-11 years ago for her own “protection” has the capacity to be very engrossing. The original “man out of time,” Captain America is one of the world’s most popular superheroes, in large part because of his naiveté and idealism that stems from the fact that he’s not exactly “of this world.” Silk’s situation is far more emotionally charged than Cap’s, so it should hopefully lead to some very dramatic comic book moments. I also thought Cindy had excellent chemistry with Spider-Man (and the final panel of the comic would confirm that). There’s clearly a larger force that’s drawing these two together (which also explains why the vampiric totem-hunter Morlun is going to play a critical part in Spider-Verse) but beyond anything physical that may transpire, Slott scripted some very entertaining back-and-forths with Spidey/Silk. We get another little bit of meta-commentary on the comic book industry’s penchant to resurrect its characters when Spider-Man tries to convince Cindy that she’s safe from Morlun because he’s dead, only to have him reveal “the first time” and “the second time” Morlun died … . Cindy rightly points out that having there be a “second time” is one time too many if you’re going to operate under the assumption that a character is truly dead. As for that final panel … hey, what can I say? I know there’s a contingent of fans out there that will never be satisfied until Peter is back with Mary Jane, but I think there’s fun to be had with a Spider-Man/Silk pairing. It would be nice for Peter to be with a woman who’s not a damsel in distress, and who is not an untrustworthy criminal like Black Cat (as much as I enjoyed their romance). 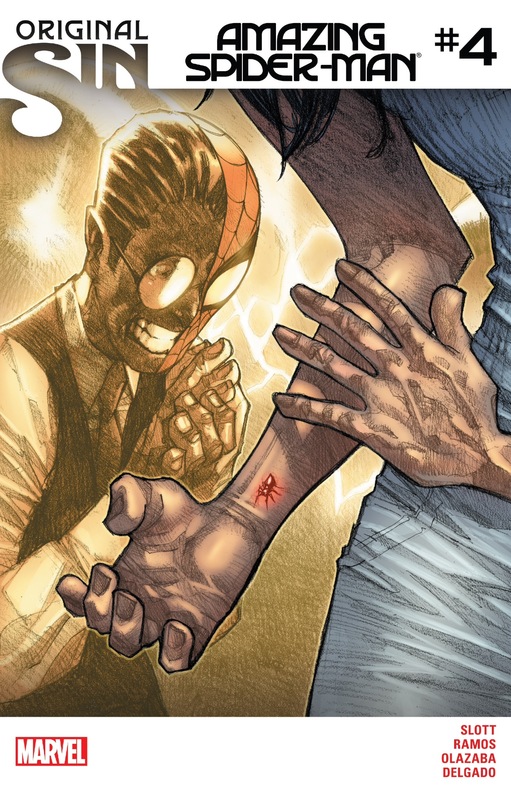 As I just alluded to, Spider-Man and Silk share something that makes them wholly unique in the universe, and thus it’s expected for there to be some kind of inexplicable force that pulls them together. Besides, I wouldn’t be surprised if we later learn that the two characters weren’t totally acting on their own volition in that final page. 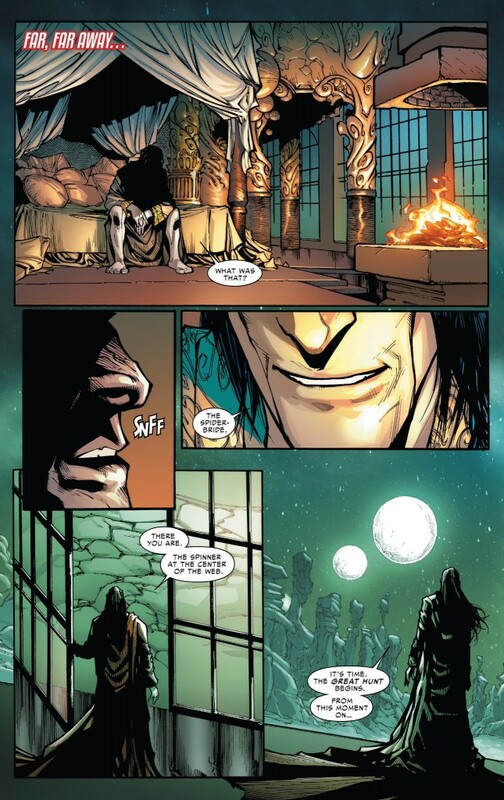 I’m not suggesting anything sinister here, but if Silk is the “Spider-Bride” as Morlun referenced during his appearance, that leads me to think that she and Spidey are going to be inextricably linked, regardless of the fact that she happens to be an attractive female with spider-powers. Again, you say a lot of what I’ve been thinking, and more deftly. Love your write-ups! I am curious to see where this is heading. Slott has cleared the board of the past woman and created a new one. I like the fact she has similar powers. Her outfit not so much. If your eyes and top part of your head is showing people are going to guess who it is. The pacing could be better. Maybe he needs a few extra pages let the characters interact more. Before I start I just want to make this clear I don’t like judging any unfinished work, plot etcetera but I have to judge at some point because writers finish an issue at least three months before we read it and fans opinions can’t help a title nearly as well if we wait until a writer is already half way through there next six issue arc before we state our minds. I’m game for Spider-Man having a good sidekick of any age an equal/semi-equal partner even better someone of the opposite gender even better. While I agree there is an atrocious gender imbalance I don’t think Silk is in a prime position to be this almost messianic champion of equality you were talking about THAT position goes to Spider-Girl the daughter of Spider-Man who had the longest running female solo title at Marvel and could easily be the answer to Wonder Woman they’ve been looking for for a decade if they tried. I like Silk is not a Mary Sue not yet and she’s not a Mary Sue certainly not yet but let’s not kid ourselves she is a creator’s pet and as Warren put it the board has been cleared for her. From the beginning Dan has wanted one of his own characters to be a successful perhaps permanent love interest the presence of such a character would mean residual checks after he’s off the book. I’m not bothered by these kinds of things if they work well in narrative storytelling but the intentions behind the poorly executed management of Peter’s love life these years are so transparent. Silk’s a cool character if she were created in the 80’s I think she’d be a big hit but there have already been so many spider-women that we are approaching an event meant to kill a lot of people in spider costumes. And being less strong than Peter is so sexist and cliché with Spider-Girl it made sense her spider genes were diluted by having a non powered mother but female spiders are a lot stronger than males. It was just when I read the story and got to Morlun my third favorite supervillain calling her the Spider-Bride that I lost it. that is honestly the most offensive thing I’ve seen since OMIT is some quick totemic driven hook up supposed to be superior than a union made holy in the eyes of the One Above All? if this goes past Spider-Verse I certainly think that’s what Dan wants us to accept. We haven’t seen anything Mary Sueish and in all areas of his writing I have seen Dan improve with the relaunch but judging by the cover of Issue #5 it looks perfect for a Mary Sueish moment. While I’m with you that a new strong female character is a good thing, and it’s hard to say exactly where this is going, Silk so far has been set up as anything but independent. That final page made my stomach turn, and not in a good way. Mystically influenced or not, having your new female character make out with the star in her very first appearance is about as sexist as you can get. Did Venom swoop in for a kiss in #300? I realize it’s hard to work any new character into a solo book without having their life somehow depend on Spidey, but that’s no excuse why we don’t have more Jean DeWolffs. Or serious female villains for that matter. That’s part of the reason I think I’m going to skip out for a while. The other is that I have serious doubts whether Spider-verse is the story for me. I really hate 90% of the mysticism that goes on in ASM (or superhero comics in general) since it severely distances the reality of the comics, from, well, reality. Not that I think a New York City inhabited by the Fantastic Four, 13 different Avengers teams, and a supervillain on every corner is exactly realistic, but magic is where my suspension of disbelief usually breaks. If the central conceit of superhero books is “what would an ordinary person do with extraordinary powers?”, changing the rules of the universe (all the Web of Spiders and Spider Totems and anything involving the godforsaken Madame Web) weakens that to “what would an extraordinary person do in extraordinary situations?” and it ventures into pure fantasy. I don’t want Peter Parker to be the Chosen One, I want him to be a regular dude. I don’t know. For the same reason I also hate when things get too supersciency (FF) so cleary I’m just too picky. Anyway, from here I’ll be watching from the sidelines. Which is why it’s great that your blog will fill me in on everything that’s happening!